The Rock Art Brewery is a nice little outfit in Morrisville, Vermont that began, like so many great craft breweries, in an Alehead’s basement. Today the operation has grown, though not by much, and that’s just the way that founder Matt Nadeau seems to like it. With a taste of fall in the air and the crawl of ‘peeper traffic behind them, your Baron and Baroness tucked into a bomber of Rock Art’s Pumpkin Imperial Spruce Stout. 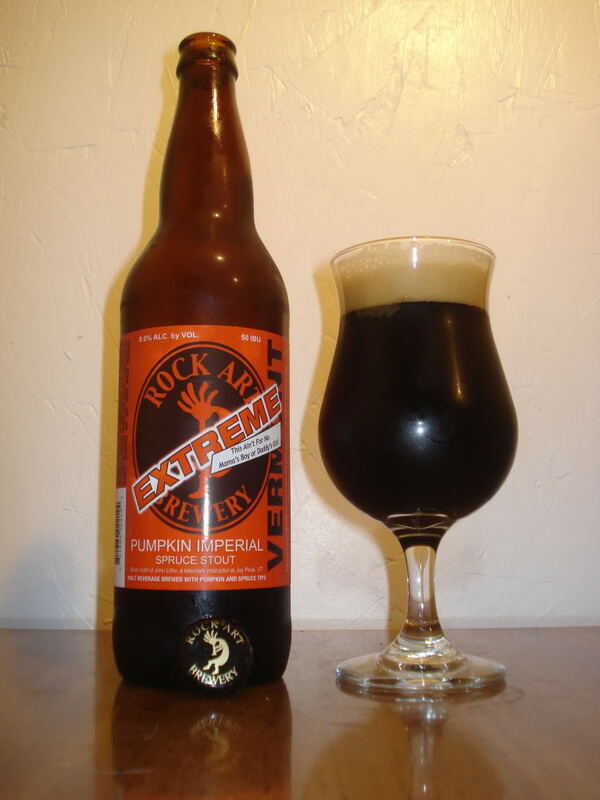 Bottle Description: A big stout brewed in the colonial fashion with large amounts of pumpkins and spruce tips added to the kettle for flavor and bittering qualities. The pumpkins compliment the malt flavors, and were used to add sugars to the mash. What ever you do, do not think this is going to taste like pumpkin pie. Appearance: Bloody dark. Pitch with zero light penetration. Head: Tall coffee-brown; single finger; solid retention. Lacing: Sticky and streaky with great hold. Nose: Chocolate, coffee, and roasty toasty malts yield to subtle spruce undertones. Unfortunately, the delightful olfactory experience is more than a little bit overwhelmed by powerful alcohol notes. Taste: Very astringent with massive spruce notes backed by malt, caramel, and cocoa. As the bottle promised, whatever pumpkin flavors may have once lived in the brew were completely lost. Mouthfeel: Oily and rich with nice carbonation. Drinkability: The Baroness assessed the brew two twitches and a lip smack: “Oooo… no, no.” While this reaction is, more often than not, the sign of a winning brew, this time the Baroness was onto something. While the suds were fairly drinkable for an 8% ABV, they proved far too rich for casual imbibing and the spruce became too much for these taste buds through the 22oz pour. Rating: 2.5 hops. A challenging bottle. Kudos to Rock Art for creativity. We look forward to trying additional offerings from Morrisville. Posted in Tasting Notes.Tagged Gillinghams, Morrisville, Pumpkin, Rock Art, Stout, Vermont, Woodstock.